I’ve been wishin’ and hopin’, and thinkin’ and prayin’ … for about the last eight months or so that I would get at least another year out of my car. Unfortunately, I learned this week it was just not meant to be. You see, I love to drive and up until my last couple of vehicles, it showed. Well, I guess it wasn’t my love for driving that showed so much as my love to drive quickly … and maybe, just a little stupid? Thankfully, the crazy part was long gone (mostly) when Connor was about sixteen months and I bought my first new car. 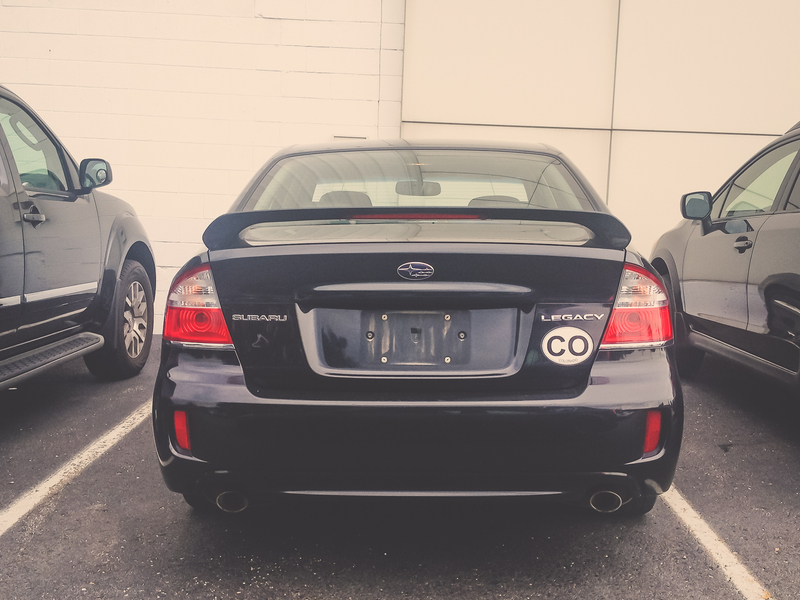 I’ll never forget how proud I was driving that beautiful black Subaru Legacy off the lot (strangely, the exact same moment it lost $3,000 of its value). That was in 2007. This past December after a summer of overheating and short-term fixes, I put new head gaskets in her and I pleaded with her … ‘Black Beauty, I need you to go about another 50,000 miles for me. Can you do that? If I back off on the pedal, would you just do me that one favor?’ Well, I either did not back off as I promised I would or she was just that tired because this past week, she started stalling … like while I was driving. I took her right back to where she’d just been serviced and I told the mechanic that I didn’t feel safe driving her. Heck, I get to drive a Lincoln for a loaner … it’s not all bad. The mechanic called me Thursday and gave me a really great explanation of what was wrong but all I heard was … ‘Ma’am, your car is headed for a relatively speedy, expensive death.’ I like to go fast, but not like that. I hung up and knew that it was time. The good news was I’d planned to take Friday off. I hadn’t planned on going car shopping, but I didn’t want to have the time to mull over changing my mind. My dad took me to my car in the morning and I picked her up and headed for the gas station (thanks, mechanic guy for running her down to near empty), the vacuum and the car wash. My dad called not long after I got gas and I responded … “I know.” I’d left my coffee in the truck. That was NOT going to be the way to start this day so he brought my joe and hauled off my extra schtuff from the Beauty. Does it strike anyone else as crazy just how much one can accumulate in such a small space over time? And yes, Alyssa, I found some of your French fries. Thankyaverymuch. I had my heart set on a smaller car. I don’t need a ton of space. I need something that’s reliable and going to get me good mileage (and look cute and sporty and not at all like an old mom car). Connor and I first drove an Impreza. William, our sales associate, rode with us and by the time we got back Connor had his legs off to the side and when I asked him what he thought he said, “Mom, look at my legs.” Point taken. William had mentioned the Legacy was the sleeper car of the Subaru bunch. Well, I just so happen to be familiar with the Legacy so I walked down the row of those available. The first couple had the V6 … mmmm fast. They also were more expensive and less than efficient on fuel economy. Pass. Just two beyond those, I stopped. There it was. The second I saw her, I knew she was mine. We drove her and Connor was ecstatic and I was floating on a cloud. We went back into the dealership and had William start running some numbers. I think he was a little taken aback when I put on my negotiatior hat. Yes, I realize it already had a sale price. No, I don’t care. After a couple of rounds of back and forth, I asked him to do me one more favor. I’d seen a t-shirt I liked so I told him if he would throw that in, we had a deal. Done. I also told him I wanted to take the car that day, lest I have more time to change my mind. He, surprised one more, assured me it could be ready in two hours so we took off to visit Grandma and enjoyed lunch at Rose’s on Reeds Lake. Gluten-free pizza score! When we got back, we completed our paperwork and WIlliam gave us the quick rundown of features that differed from my car. Hello back-up camera. We grabbed the couple of remaining things out of Black Beauty and each hugged her spoiler (my favorite part). I patted my CO sticker because, well, its worth far more than a sticker to me and we said goodbye. Honestly, the best part of the whole experience was when we were just about to take off and William (whom we’d gotten to know quite well), shook my hand and said he’d enjoyed working with us and I told him the feeling was mutual. He then said he thought Connor was a great kid and we’re doing a great job with him. He may have even had a tear in his eye? I guess we have that effect on people. Thankfully, I beat the rain home and tucked the new Legacy in her spot in the garage. I teased Connor telling him we would call her ‘Purple Nurple’ but that’s probably not okay … so we’re still working on a name. 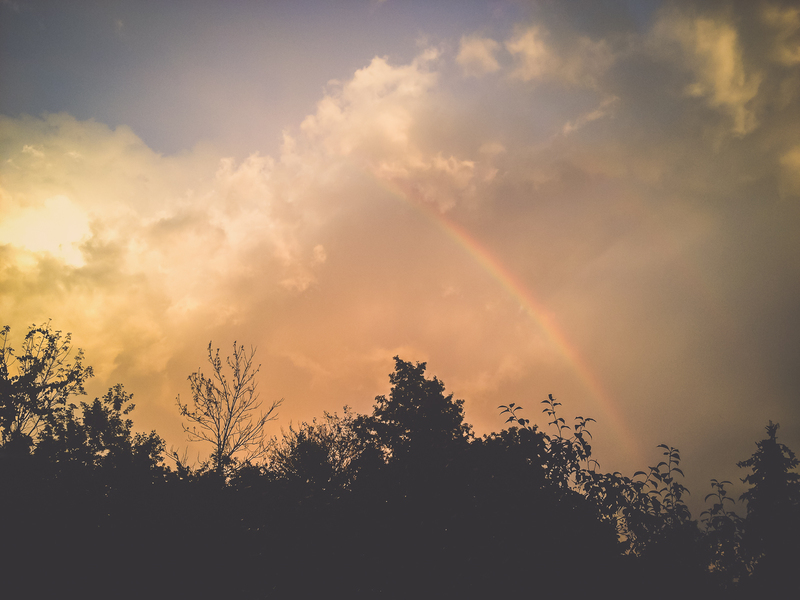 And, after the rain, God sent a little rainbow for me … almost like a little affirmation that the Legacy will live on. This entry was posted in the road to acceptance, Uncategorized and tagged acceptance, appreciating the journey, change, confidence, connor, peace, subi 2 by staci. Bookmark the permalink.